Please Note: For agricultural reasons Luludi Living Art cannot be shipped to Hawaii. Equal parts living art and landscape, this tiny garden encourages meditative thought and peaceful moments. 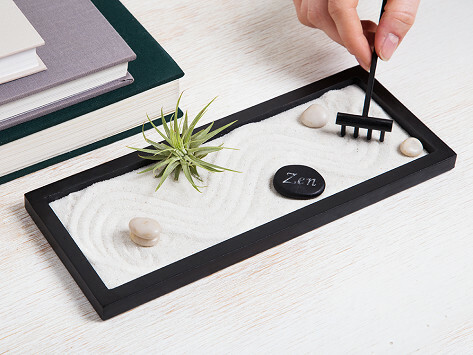 Rake the sand to center yourself at home or in the office. And an easy-to-care-for air plant provides a low-maintenance but refreshing dose of green indoors. The plant décor from Luludi is like living art that brings a bit of calming greenery indoors. Each piece acts as a little oasis in busy lives, and can even serve as a meditative tool. 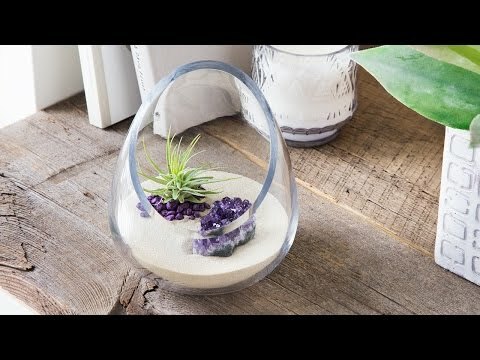 Spiky green air plants stand out against the texture and shine of stones, crystals, and moss, whether in a cut-glass vessel or a Zen garden. Founder Liza Fiorentinos has a green thumb, and then some. Before focusing on plants, she worked in office buildings, where the fluorescent lights and lack of greenery bothered her. Liza knew the importance of needing even a small dose of peace and green in each day, and the benefits of plants—like how they help detoxify the air. Now she’s living her dream by creating large-scale plant installations for bigger spaces—and these pint-sized pieces to add some green to anyone’s home or office.